Please add my blog to your sidebar blogroll! please add my blog also! Please add my blog you your sidebar blogroll too. Please add my blog to your sidebar. I am a CGOA member. Is there a way to submit my blog as a link on the CGOA blog sidebar? I am a CGOA member as well. Please add my blog to your sidebar also! CROCHET HALL OF FAME!! This is an exciting new committee of CGOA and our board liaison is Cari Clement. Cari has a particular interest in crochet as art and has studied and presented lectures about artists who use crochet as their medium. Amazing artists from the 70s are the icons who paved the way for crochet to become what it is today--many of whom still provide the dynamic direction crochet continues to take. Crochet artists take crochet in a totally revolutionary direction. Promoters and educators of crochet have been isntrumental in expanding the reach and knowledge of crochet to all of us. Gallery owners, authors and editors also contribute to the promotion of crochet. WE NEED YOUR HELP AND SUGGESTIONS!The committee wants to celebrate these women and men in a way that would not just raise their profile, but that would provide inspiration to all CGOA members. So, please, send your ideas and your suggestions of those who have inspired you. Think big, think creative, think icons! This project will not only be a lot of fun, it will also make us really think, really research and really get inspired! Send your suggestions along with a few sentences that describe why you think he or she deserves to be nominated by the committee, to: CGOAHallofFame@gmail.com. If possible, please include contact information for that person. Please add my yarn related blog to your members blogs. 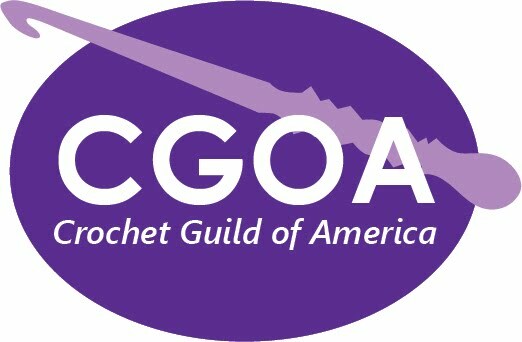 I am a CGOA Member.